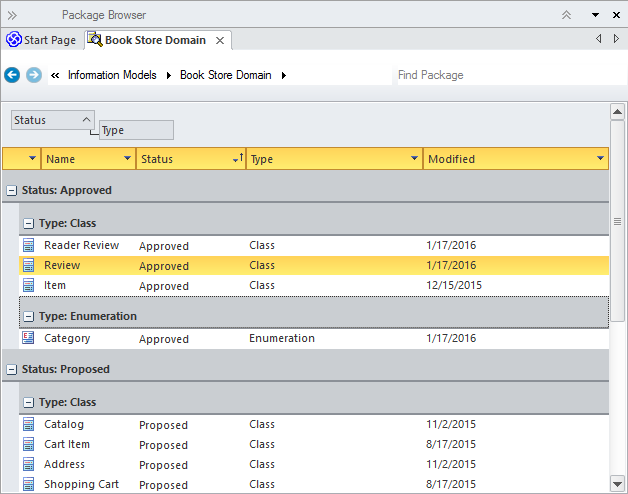 The Package Browser is a powerful tool that provides a convenient list of the elements in a package displayed in a List or a Gantt view. The list view allows a modeler to work on the elements in the package in a spreadsheet like view, editing properties and notes inline and grouping and sorting the elements. The Gantt chart view allows analysts, architects, project managers and others to view the resource allocation for an element in a convenient and familiar time based view. The Package Browser provides a convenient and alternate view of the elements in a package. The list view can be used as a workbench for viewing the elements in user defined order, changing the elements properties and adding and deleting elements. The ability to display the elements grouped by various properties and Tagged Values allows analysis to be performed on groups of elements. The Gantt chart view provides a project management view of the elements showing how resources are allocated to individual elements. Reports for all, or a selected group of elements can be generated. 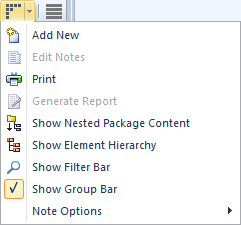 The Package Browser has two different formats or display options: a User Defined view and a Hierarchy view. The User Defined view displays all the elements in the Package regardless of hierarchy. The Hierarchy view arranges the elements in accordance with the way they are grouped in the Project Browser. In the User Defined view the items can be sorted in ascending or descending order by clicking in the column headers. The order of columns can be changed by dragging column headers left or right. A modeler can drag column headers onto the View Header (above the column headers) this will group the items in the list by that property; column headers can be nested in a hierarchy to specify groups within groups.